We held our Parish Lunch after the APCM on Sunday 22nd April. After a glass of sherry and a starter of melon balls, a choice of chilli or bolognese with a jacket potato and salad garnish was served, followed by dessert. Wine was served with the meal and tea and coffee after. We finished with a short Evening Service held in the hall. Unlike last year (when it tipped down with rain just at the wrong time!) the afternoon Christine’s Open Garden stayed fine and dry. Cream teas were served from the kitchen, there were plants for sale and a Lucky Dip for various prizes. We sat in the conservatory or around the garden, found ducks - but no hedgehogs made an appearance. A brilliant £480 was raised for Church funds. We arrived at the Church grounds from 8am on Fete day, and fortified by mugs of tea and coffee set up our stalls, to be ready for the 9.30am opening. We had a variety of tables selling jams and chutneys, books, DVDs, CDs, jigsaws, jewellery, lots of cakes; we sold plants from the church wall and even more books! There was a bottle stall, gifts in bags, a tombola and a grand raffle. We had games and I even noticed a small duck pond! Refreshments included hot dogs and burgers and hot drinks. The weather was kind to us with only a few spots of rain near the very end. A total of £1,886 was raised. 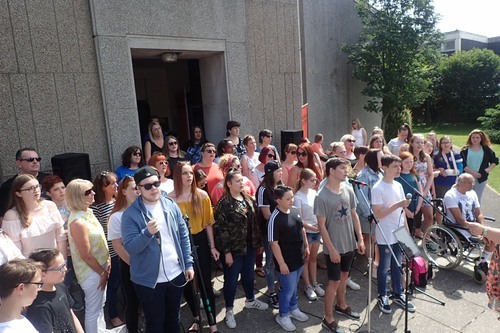 During the Fete, as part of Waterlooville Music Festival, there were musical performances presented by Urban Vocal Group (pictured below) and Singing for Fun (pictured below right). 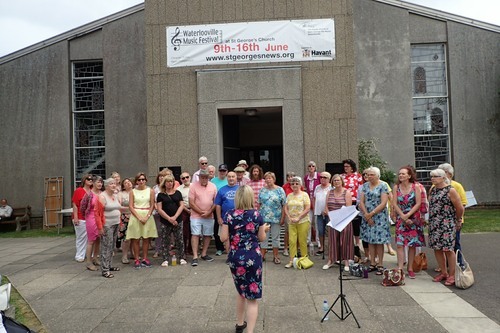 We welcomed the Portsmouth Citadel Salvation Army Band, with organist Nigel Smith and our Waterlooville Music Festival Choir on Sunday 10th June. The theme for the evening - Music from the Royal Weddings, with well loved hymns such as Praise my Soul the King of Heaven and I vow to thee my Country and Choral pieces including the beautiful The Lord Bless You and Keep You. The interval raffle raised £250 towards the valuable work of the Salvation Army. Our Music Festival continued on Tuesday evening with the Band of Her Majesty’s Royal Marines School of Music, on Wednesday we had the Portsmouth Military Wives Choir, Thursday was Folk and Ale Night with Threepenny Bit and Portsmouth Shantymen. On Friday the 60’s were re-lived and re-danced with the Silver Beatles and our finale night as usual, our very own Last Night of the Proms with the Meridian Wind Band conducted by Don Lloyd with Rachel Palmer as guest soloist. Our evening bar sold Bowmans Beer (other drinks were available!) We served a selection of rolls, ploughman’s and fruit at lunchtimes. All the evening concerts except Sunday were completely sold out this year. We gathered at 7pm in the Church Hall where starters of pates, egg mayonnaise and melon & raspberries were served. The thirty plus diners were then given the addresses of the hosts for our main course. Later we re-met together at Glendene for desserts and sat and chatted and later some had a dip in the pool. The Annual Cricket Match took place on a very hot Sunday 8th July. The event commenced with a cricket session, followed by a traditional tea of cucumber sandwiches and cakes, then the cricket final, which was followed by the opportunity for swimming and a Barbecue. 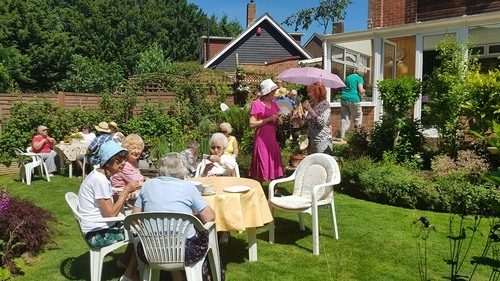 There was a coffee morning held at Margaret Deal’s home on Saturday 14th July. Like last year it was a hot day and people sat outside and enjoyed coffee and a selection of homemade cakes, and browsed at the Bring and Buy table. £105 was raised for church funds.